Subscription box is very important for a Blogsite. 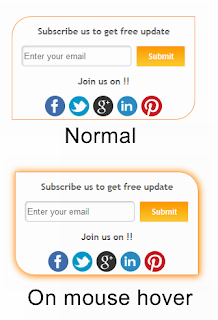 It helps to quick collect your email subscriber and distribute your future content update to your subscribers. Most of bloggers generally use Feedburner to deliver Blogsite's content update. And feedburner's default email subscription form is really not enough to get email subscribers, right? 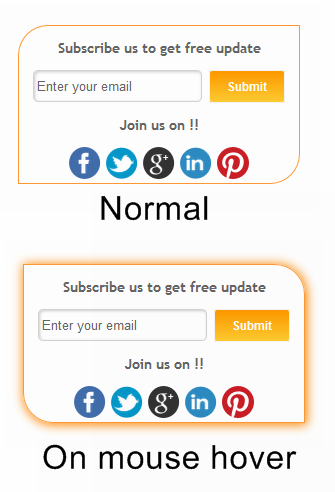 That's why I developed a email subscription form into a sidebar widget and this widget is integrated with spinning social media profile widget. This compact subscription box widget has cool animated shape effect base widget frame, Animated effect feedburner subscription form, Circle icon base spinning social media profile slot (contains Facebook, Twitter, Google plus, Linkedin and Pinterest). And all effect start to work with simple mouse hover on widget areas. Done reading! let's see how it looks like and how to add it in Blogger. This widget tested on a lot of template and all templates did accepted it. All effects works perfectly on any latest updated web browser.